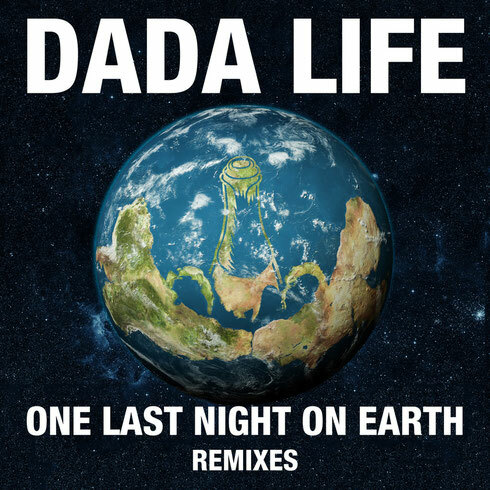 Swedish du Dada Life recently released the official remix package of ‘One Last Night On Earth’. The duo – who apparently broke the official Guinness World Record for “Most People Dressed As Fruit” at The Voyage when 629 fans turned up dressed as bananas – have called up official edits from Speaker of The House, East & Young, Nom De Strip and Young Bombs. A varied selection from Olle Corneer and Stefan Engblom, the set delivers everything from popping electro garage to big room to what could possibly be termed Balearic progressive. Vancouver duo Young Bombs turn in the remix probably closest to the Dada Life sound, their hands-in-the-air, sweeping synth and bass production capturing the same vibe Dada Life manage to inject into every track. On the other end of the spectrum, Speaker of The House’s ethereal cut drifts dreamily along, allowing the vocal to fly easily across a tripping bassline that develops unexpectedly into Balearic territories as lazy, muted guitar strings and soft percussion take it in a totally new direction. Also on the line-up is Edinburgh producer Chris Elliott, better known as Nom De Strip. His edition jumps from thundering big room elements to swinging, almost shuffling house, crafting one central, off-beat, syncopated rhythm that ties the whole track together. Dutch duo East & Young wrap things up with a remix that hints at UK garage but has enough big anthem elements, popping electro sections and chopped vocal lines.